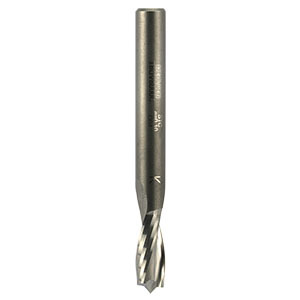 In response to a specific requirement by a customer, Wealden have designed a high quality micro-grain two flute solid carbide spiral upcut cutter with a scoring centre point, primarily intended for use on CNC machines cutting small components. The design enables the component to remain fixed in the sheet whilst being machined and thus ensuring good vacuum hold down. Upon completion the components can be snapped from the sheet and finished with a trimmer or arris trimmer.